Many people had given up Tiger for dead after his self-imposed implosion a decade ago, followed by a long string of debilitating injuries. Early on, the smart money said that he’d obliterate every record in the book, but after the fall it seemed more likely that he’d never win again on a big stage. He’s been a human interest story as well as a sports icon for decades — the ultimate needle-mover — and this pushed the needle past 11. When someone is expected to win, it can be exciting, but when they’re constantly teetering on a pinhead — with disaster on one side and greatness on the other — that makes for pure spectacle. For quite a while, many fans and writers referred to KVD as “the Tiger Woods of fishing.” Certainly he had unmatched talent and periods of exceptional dominance, but he always blanched at the comparison, particularly after Tiger’s human foibles were exposed. VanDam never experienced that precipitous decline in success and admiration that Tiger suffered. He might’ve peaked in the 2008 to 2012 time period, but he continued to win long after that. Occasional rumors of his demise were greatly exaggerated, and usually answered with a signature victory. So who is our Tiger? 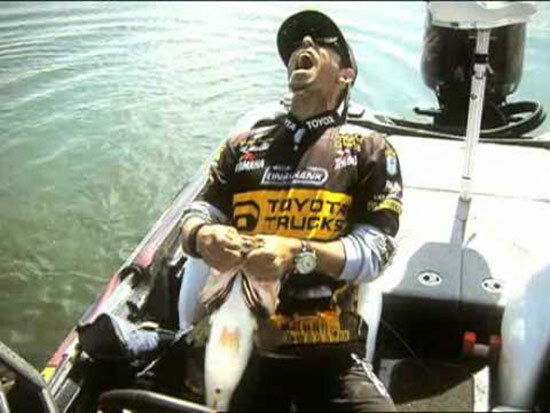 Thinking of a smaller member of the same family, a cat has nine lives, and apparently so does Mike Iaconelli, who in some ways was always the yin to VanDam’s yang. Ike experienced the highest of highs and also the lowest of lows. The highs were AOYs and Classic titles and unmatched publicity. The lows included everything from the broken American flag lightpole at Toho, to the DQ at Wylie, to cursing a dog at Grand Lake, to his recent BPT outburst. But when he’s on, it’s a thing of beauty. When he wins, or threatens to win, the whole bass world knows it. Ott was obviously a huge story in Knoxville, but it would’ve been almost as memorable if Ike had claimed another Classic title. Like Tiger, as long as he’s in the running, everybody seems to have a rooting interest for some particular outcome — pro-Ike, anti-Ike, or just waiting for something unexpected to happen. Even if an athlete’s past bad acts are unforgettable or unforgivable, that can make watching them come back and get in the zone for even just one event.magical. As I’ve written before, it will be a shame when Ike retires because we’ll no longer have that thrill. Indeed, while I would’ve been excited to see him win last month’s Classic, the only reason I could think to cheer against that result was because I assumed it might lead to his retirement from competition. As long as he’s in the game, there’s always reason to watch.